For two days in a row I have gotten sunburned. My poor Irish confused skin is not used to so much sunshine and warm weather, even when wearing sun cream. I smothered myself in it this morning before heading out because I knew we would be spending a lot of time under perfect blue skies. We parked for free just off Faubourg Madeleine and dropped into the bakery to grab pain au chocolate du beurre for breakfast. We ate it as we walked towards Bourgogne Randonnées where we planned on hiring bikes for the day. An American man and Chinese woman were getting instructions for their bikes when we arrived. 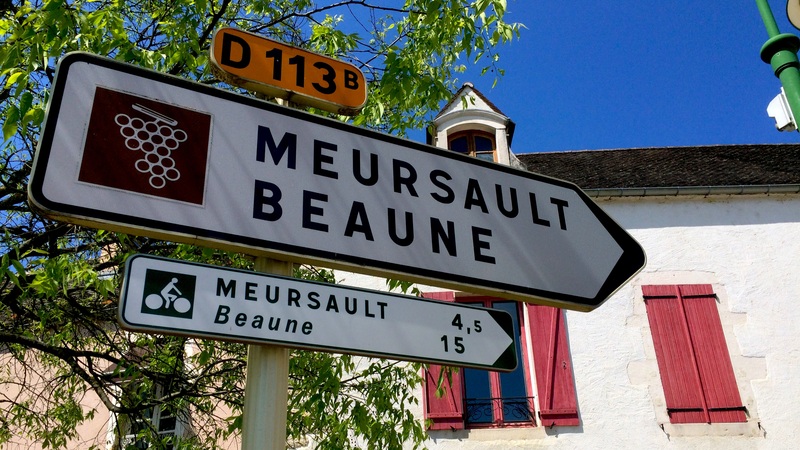 Soon we were given friendly instructions for a bike journey through the vineyards of the Côte de Beaune towards Puligny-Montrachet. We were given a piece of paper with the towns marked along with the wineries that would be worth visiting. The ones who speak English were highlighted for us. We were also told where we could find a gourmet lunch for a very decent price. Eric was given the map and all the emergency kit material for punctured tyres. We went in the direction of the traffic in a circle around the old ramparts of the city until our turn off. We knew we made it to the official trail when we came to two pillars marking the “veloroute la vie des vines.” From then on we cycled down narrow paths and roads throughout the spring vineyards. The vines are just beginning to leaf out. I can only imagine how beautiful it will be in late summer and early autumn. People wearing shorts and t-shirts were hard at work in the vineyards preparing the vines and the soil. After the initial incline we coasted towards Pommard. 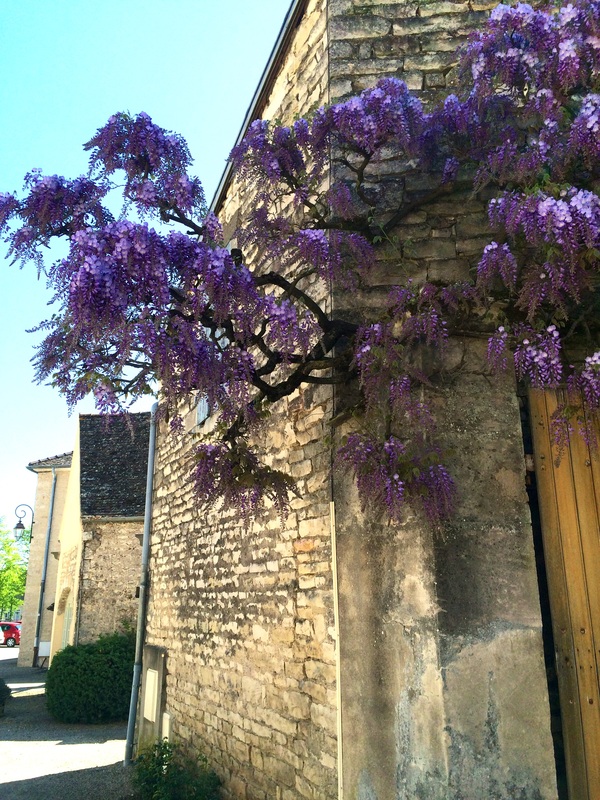 Cycling through the villages became a real treat with their narrow laneways between buildings, large, arched wooden doorways, courtyards, and the pungent scent of lilacs and wisteria blooming. Shades of purple softened the yellow tinted walls of the buildings they grew against. We stopped for a quick break in a small area shaded with tall trees. It has been made into a roadside stop for cyclists, complete with bike stands, picnic tables and recycling bins. Our final leg of the journey was almost over before lunch at it was literally all down hill from there. We zoomed the last stretch into Puligny-Montrachet. 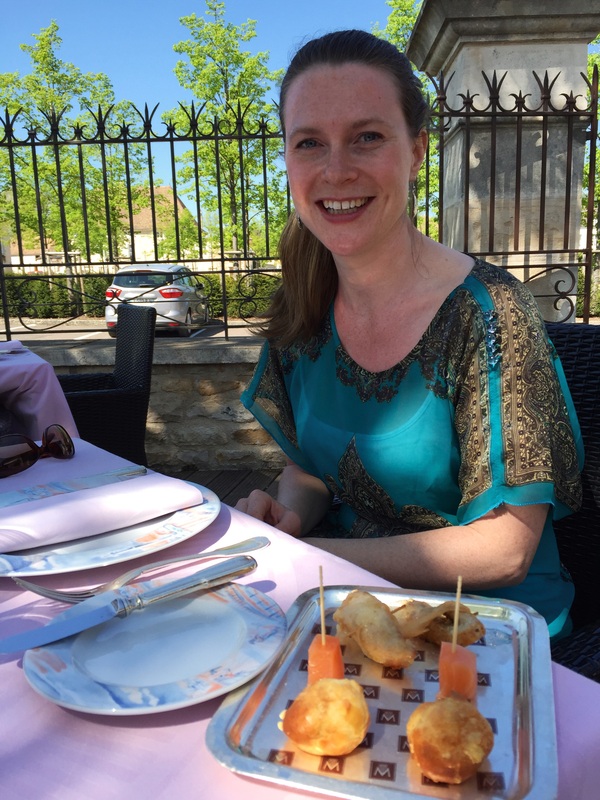 We parked the bikes at the edge of town and walked in to check out the recommended restaurant with one Michelin star – Le Montrachet. The town was quiet before 12:00. Few people were roaming the streets. From a park bench in the sun we watched the workers making their way into the hotel/restaurant. Finally, we became their first lunch guests and were seated on the terrace under the shade of a large leafy tree. We chose from their April lunch menu, this time making sure that we each had something that the other was not having. We were soon surprised when a small platter with bite size appetizers arrived. Our waiters and waitresses described each thing to us, unfortunately we understood very little. My description of them would be a sort of cheese profiterole, smoked salmon and chicken goujons. Those names don’t do them justice as they were far more beautiful and delicious than anything you could find in the freezer section of Tesco. After a seafood and vegetable cream our ordered starters arrived. By then I was fully lulled by the flavours that lingered. When our mains came out I think I forgot the rest of the world existed! Along with our desserts we were given one last slate of sweet goodness to enjoy. After over an hour and a half we finally started back towards our bikes. The first climb back up the hill was killer! 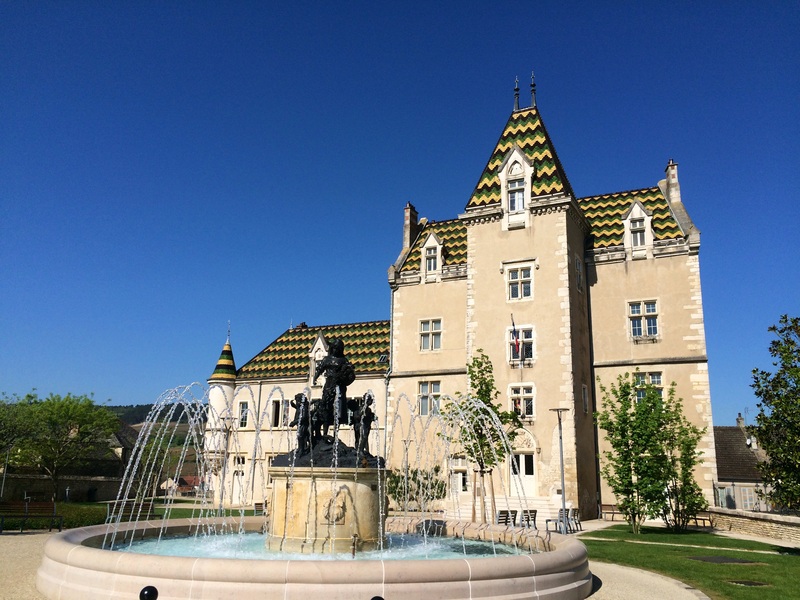 We arrived back into Beaune and once again, I was sunburned. This time only on the tops of my hands and feet. We wandered around the old city for a while, visited the wine museum and then headed back towards our hotel. By now the area is over-run with tourists, both French and American. By no means have we seen all of what this area has to offer. It begs another visit. Good and tired after cycling for 35km today, we stopped at the grocery store and picked up cheese and bread for a small meal back in our hotel. Hopefully we wont be too sore tomorrow as we jump in the car for a long journey for Zurich as we avoid all the toll roads. 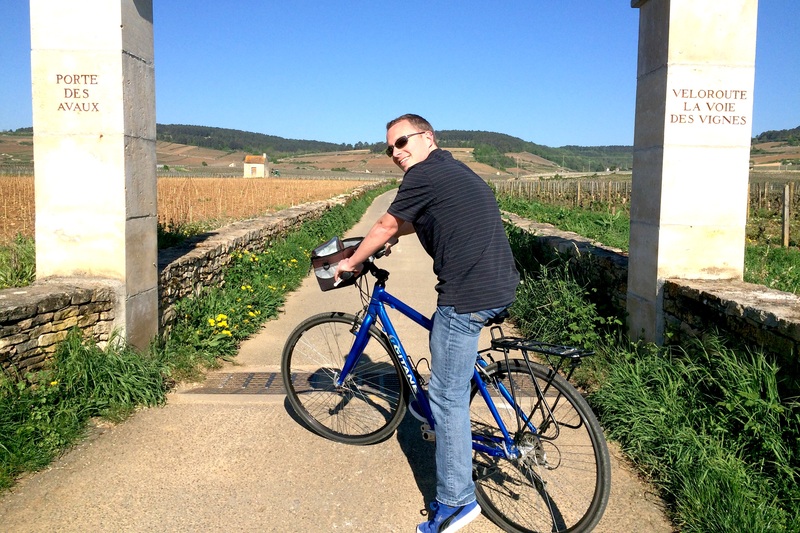 This entry was posted in BRING A PASSPORT and tagged Beaune, Cycling, France, Le Montrachet, travel. Bookmark the permalink. Soooo enjoying the trip with you. Your writing skills are excellent, both of you. I can almost smell the lilacs! Thanks Aggie 🙂 Almost as nice as the Okanagan!